I usually use Rust-Oleum 2X gloss spray paint for my rockets. It's a decent brand, not too expensive, but with a good reputation among rocketeers. The Big Dog is meant to be painted all white, with a red nose cone. The red should match, as closely as possible, the color of the large, wraparound decal which will go on the airframe over the white paint. That's tricky, because the decal comes on a yellow backing, so it's hard to tell what the final color will be. I had to judge from pictures online, and on the box. I painted the Quad Runner gloss white and "Apple Red," and I had originally intended to use this same paint on the Big Dog. But I stopped into a Pep Boys auto parts store, and decided to look at their paints. A lot of people on The Rocketry Forum use an auto paint going by the name of Dupli-Color. They had this paint at the Pep Boys, and I'd heard good things about it. I picked up a can of their filler primer and two paints - Super White and Cardinal Red. Dupli-Color is more expensive - by about 3-4 dollars a can, but I was hoping I might get a smoother, finer texture than I usually get on my paint jobs. I think I do rather well, but up close, I can see a slight texture there. I thought a special auto paint might be the solution. Filler primer is used to fill in flaws and scratches. On rockets, it's good for filling in little spots on the airframe you didn't successfully fill with CWF (wood filler), and also for filling in small amounts of wood grain on the fins, if some is still exposed after you've worked on those. It has a "build" to it, so it fills small flaws in nicely, which can then be sanded smooth. Usually, when I paint smaller, low power rockets, I use a little rig I built. It consists of a piece of wood with a dowel rod coming out the top, and at the end of the dowel is a used rocket motor. I just insert the motor into the rocket, and it stays upright on the stand. This works great for a standard A-C 18mm motor rocket, and if I need to paint a rocket that has a 24mm D or E motor mount, that's easy - a used 24mm D or E motor will fit right over a standard 18mm motor. I put this rig on a lazy Susan and I can paint the whole rocket, keeping it upright and turning it as I go. As I mentioned in the Skill Level 1 Big Bertha series, you can use a rolled up newspaper as a painting wand, but then you have to figure out where to put the painting wand and rocket as the paint dries. With this rig, I can leave everything as it is, and don't have to worry about messing up the paint job - or having the rocket fall over and getting paint on a table or the carpet. 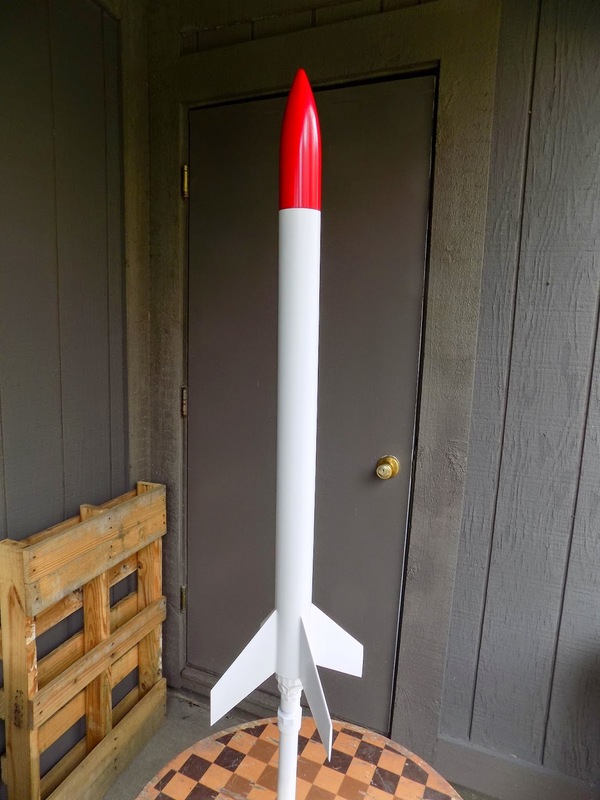 Problem with the Big Dog is that it's much larger than any rocket I've painted so far - and it has a 29mm motor mount. I don't have any used 29mm motors, because this is my first such rocket. The rocket is a little too large for a paper wand, and any way, I wanted to let the paint dry undisturbed, without having to ram the paper wand in between some books or... whatever. So, I went to the hardware store with my digital caliper in search of a solution. I needed... something... cylindrical, which was as close to 29mm in diameter without being any larger. I was hoping the plumbing section would offer a solution. Turned out, it did. Turns out, a coupler for 1/2 inch PVC pipe is just over 27mm in diameter. A little masking tape would make a snug fit inside the rocket body. I found some adapters and some kind of base everything could screw into, and made a kind of wand I could either screw to a plank of wood to make a new painting stand, or simply set the wand down upright - the base is heavy enough, it won't tip over. via another 3/4 inch adapter to a 1/2 inch adapter, which holds a length of 1/2 inch pipe. of the 1/2 inch adapter. The rocket slides over the coupler and the top of the adapter. Ted Macklin pointed out to me that a 1 1/8 inch dowel is about perfect to fit into a 29mm motor mount, so that's another option for you. But with this, I didn't have to do any sawing or drilling, and I can screw down the base for heavier rockets if I need to. I put the rocket onto the PVC stand/wand, and made sure to mask off the screw-on motor retainer - you don't want paint or primer on that, or you could have a tough time getting the retainer on and off! Something I've recently learned about priming rockets, which I had not done before, is that it's important to lightly scuff the plastic nose cone first. For a long time, I was obsessed with making sure everything was as smooth as possible, and the nose cone was the easiest part to get perfectly smooth. But primer works, basically, by giving the paint something to hold on to. A plastic nose cone, especially after we've sanded off the flash and filled in the divots and troughs, is very smooth. The primer itself may have a hard time holding on to that. You need to give the primer something to grip to. I had read about scuffing the nose cone first, but I was nervous about it - wasn't I supposed to make the surface perfect first? But I have one rocket which has suffered some chipping because of a smooth nose cone - the Estes Mini Honest John. It's got some spots where the paint and primer have completely chipped off - probably due to the nose cone colliding with the rocket body after the nose cone ejects. You can also see here I hadn't yet learned how to fill in the low spots on the nose cone. This isn't merely a paint chip. This is paint and primer flaking completely off! You do this with sandpaper. You don't have to scuff the heck out of it - don't use anything too coarse. You're just giving the nose cone a little tooth - something for the primer to hold on to. The instructions on the primer can said to use 320 grit sandpaper, which is what I did. That's still a "fine" sandpaper, but it will take the shine off. Sand the whole nose cone until it's slightly rough to the touch - and then wash off the dust. Remember in the last post how I wrapped some tape around the shoulder of the nose cone? Some people just put the nose right on the rocket and prime and paint away. Apparently, this is usually OK. But I've lived in enough apartments with windows painted shut, that I worry I might seal the nose cone to the rocket - then I'd have to break that seal, potentially chipping the paint in the process. I used to pop the nose cone onto a dowel rod and prime and paint it separately. Then I'd have to find some place to put the dowel rod while the nose cone dried - usually in a cup full of pens. Now I prime the whole thing together, and if the rocket and nose get the same color paint, I paint it this way as well. I put the nose, wrapped in a couple layers of tape, into the airframe. Because of the thickness of the tape, it won't go all the way in - there will be a gap. That's what I want. Then I prime - and sometimes paint - the whole thing at once. The nose cone does stick, but when I have to break the paint seal, I break it at the tape on the nose cone, not on the airframe. Here's the whole process from an upcoming build post - the Estes Cosmic Explorer with an E-motor upgrade. Before priming, you want to dust the rocket to remove any epoxy you sanded off the fillets, any CWF from the tube spirals and fins, and any ambient dust which has settled on the rocket. I tried a tack cloth for the first time. Tack cloth is basically cheese cloth infused with a sticky substance. Rocketeers have mixed feelings about tack cloth, because some feel it leaves a sticky residue on the rocket, which can effect the paint job. It certainly leaves a residue on your fingers! But if you go lightly over the rocket, it should pick up the dust, and not leave anything behind. Wash your hands before moving on. The Dupli-Color filler primer was really nice, though it took more coats than Rust-Oleum filler primer to fully cover the rocket. The filler primer does its job, filling in any wood grain, tube spiral - and those scuff marks you put on the nose cone. You may think, at first, that the tube spirals and wood grain haven't been properly filled in, but once you sand the primer, you should see that most of that stuff is gone, and if it isn't, another coating of primer will take care of it. I usually do the fins first, then the rest of the rocket. Start with the trailing edges, then the tip edges and leading edges. Do each face of each fin. Then I go up to the nose cone and spray a line all the way down to the bottom, turn the rocket a little, and repeat the process, trying to overlap slightly with each pass. It's best to do light coats. When painting, you want to avoid coats that are too heavy, because you can get a run in the paint. But if this happens with primer, don't freak out - most of the primer will be sanded off anyway. Once the primer has fully cured, you sand everything smooth. The can I was using said you can sand after two hours, but I waited until the next day. Using 400 grit sandpaper, I sanded the whole rocket, in little circular motions. The Dupli-Color primer didn't load up the sandpaper the way other primers have done. Sometimes, when sanding, you get a mass of primer stuck to the sandpaper - a little silvery splotch that isn't good for anything, because the abrasive is clogged in that spot. into the abrasive surface, creating dull, silvery patches, and the paper is no longer any good for sanding. You can extend the life of your sandpaper by occasionally brushing out the excess dust with an old tooth brush. Once you're done sanding, before you paint, you should clean all the dust off the rocket. At this point, instead of a tack cloth, I used a piece of microfiber towel with a little rubbing alcohol. This takes off all the dust, and it evaporates quickly. The Rust-o 2X paint is enamel. The Duplicolor is lacquer-based paint. I don't know the technical, chemical difference, but I do know that you should pick one or the other - do not mix them, or you may get weird bubbles and smearing, as the paints can react with one another. The lacquer paint took a lot more coats to cover the rocket. In fact, by the time I was satisfied that I could no longer see through the white, I had used the whole can. The texture was fine, but nothing better than I'd gotten with Rust-o. But it was pretty. A day later, I removed the nose cone and did the Cardinal Red top coat. The whole rocket turned out beautiful. After the red dried, I put the rocket together to take a look. The rocket is nearly done. Just a few more steps to go. I love the larger Quest nose cones! This shape is the most common one in hobby rocketry, and is known as a tangent ogive. An ogive is a shape made of segments of two circles intersecting. You find ogives not only in rocketry, but also in architecture. A Gothic arch is an example of an ogive in architecture. An ogive nose cone has a profile defined by these imaginary circles intersecting. A tangent ogive is one in which the airframe is tangent to the imaginary circle. Another, less common nose cone shape is the secant ogive. This is again defined by the intersection of the segments of two circles, but the base of the nose cone is not tangent to the body tube. The Honest John rocket is a good example of a rocket with a secant ogive nose cone. 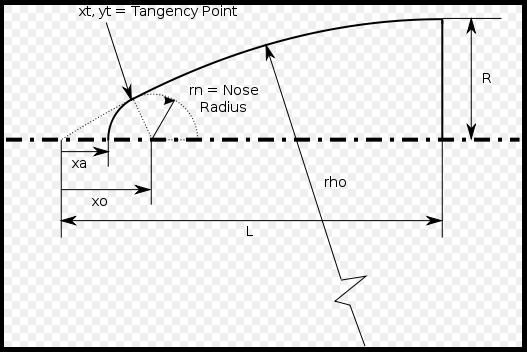 Many ogive cones come to a sharp point, but the Quest Big Dog nose cone is actually a spherically blunted tangent ogive, meaning that the tip, rather than being pointy, is a section of a sphere. 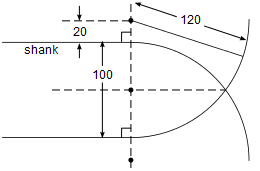 On the Big Dog, below the ogive, there is a cylindrical section to the nose cone, so the tangent doesn't come off the airframe itself, it comes off the cylindrical section. This is a nose cone with a very pleasing shape. But, like all plastic nose cones, it needs a bit of working before it looks its best. First of all, it's always a good idea to wash a plastic nose cone to remove any oils from the manufacturing process. You can do this with dish soap. Wash and dry it thoroughly. Due to the molding process, there is a bit of flash, or extra plastic, where the two halves of the mold came together. This is a visible, raised ridge on the nose cone. There may also be (and in this case, there were), some troughs, or low spots, along the seam. This can all be smoothed out with a little sanding and filling. First, you sand off the high spots. I used to do this with a very fine grit sandpaper, worried I would make a rough surface that would never be smooth on the finished rocket, but the putty I'll use on the troughs will take care of any low spots, as will the primer. So now I use a 220 grit sandpaper - still "fine" as defined by the package, but definitely scratchy. It won't be smooth when you're done. Sand all the high areas off, and don't forget the tip of the nose cone. When you're done, you'll still see some low areas. There are a few ways to fill these, but I like plastic putty. You can find this where you'd find supplies for plastic model cars or military vehicles. A popular brand is Squadron. I use Tamiya, because I can easily find it. These putties come in various colors. Tamiya comes in "basic," which is gray, and white. I prefer the gray, because I can see it, whether it's on a white or black plastic nose cone, so I know if I've sanded it correctly. The stuff smells noxious, and if you get it on your fingers... well, your fingers will be silvery gray for a day or so. I gently squeeze the tube and apply a bead of the putty all the way from the base to the tip of the nose cone on both sides, using a craft stick as a putty knife to scrape off some of the excess. You won't be able to get a lot of it off, but any excess you can remove now will save you some sanding later. The putty will begin to cure immediately, and you could sand it in as little as 15-20 minutes. But I usually set this part aside for a day or so. Once the plastic putty has fully dried, you'll want to sand off the excess. The best way I've found to do this is to wet sand. This means that you'll either dampen the sandpaper with some water, or better yet, sand the item under a thin stream of running water. This helps keep the sandpaper from loading up with dust, and helps you get a nice, smooth surface. To do this, you'll use wet/dry sandpaper, which is black, and waterproof. Like ordinary sandpaper, it comes in various grits. I start with 220 grit to knock off the mass of the putty, then move up to 400 grit. Sand in little circles under a trickle of running water from the faucet. I prefer warm water - I don't know if it helps (it feels like it does, but that might be my imagination), but it's certainly more comfortable. Stop sanding now and then and dry off the nose cone to check your work. If you see any spots that look like there's a ridge, focus on that spot. You might want to check with the back of your fingernail. If you can feel a raised spot, you'll see it when you paint. As before, don't forget the tip of the nose cone. The tip is the trickiest part to sand, and it's where you're most likely to accidentally leave a little extra putty. If you go too far, and sand some putty out of a low spot, you'll have to re-fill the spot, but that doesn't happen very often. Just use the pads of your fingers to cushion the sandpaper around the contours of the nose cone, and you'll probably take off just enough putty. This works very well. I do this with all my nose cones. Sometimes my fin filling doesn't come out great, but my nose cones are beautiful. Here's what you'll end up with. Out of focus, but you get the idea. You should've seen Rx, by the way - great show. The last step I take in prepping the nose cone is to wrap the shoulder in masking tape in preparation for priming and painting. This will lead me to a little painting trick I like to use. Next time, it's finally time to prime and paint the rocket - we're nearly done! Note: For months, I thought it was pronounced "OH-give," as in "Oh, give me a home..." My paper dictionary says that "ogive" is pronounced "OH-jive." Since the first appearance of the word is in France in the 1200's, I think "OH-zheev" sounds OK. In any case, "OH-jive" doesn't sound like a word to me. The Big Dog has exactly the same nose cone as the Quadrunner - they're identical parts. Many Quest rockets have similar spherically-blunted ogive nose cones, including the Super Bird, the Minotaur, the High-Q and the Li'l Grunt. These are attractive rockets! Once I get to the part of building a rocket where I attach the fins, I feel like things are really taking shape. The rocket starts to actually look like a rocket. Most of the hard stuff is over, and I can relax a little. That's not to say that I can take less care - you have to be precise when you attach your fins, or things will go on crooked, and the rocket will never be all it can be. As usual, I used the Guillotine Fin Jig. 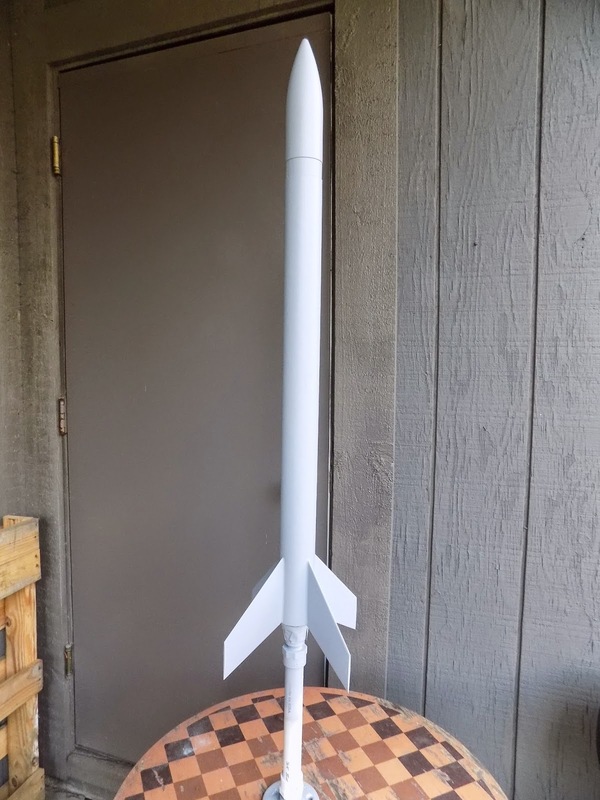 Sometimes, I'll post a picture on The Rocketry Forum or the NAR Facebook group, and people will ask me about the jig - "Is it worth the price?" I would say yes. I've found it so helpful - I don't fret about attaching fins the way I did when I first started. And I use it for more than that. You can use the Guillotine to hold the rocket while you work on it - which I did when I drilled the holes for launch rail buttons. I take the guide arms off so I don't catch them on something - a fin, or a sleeve, or whatever - and it's like having an extra set of hands. I prefer to leave the front piece in place while I work, and even stick a second piece in the middle, just to make sure I haven't accidentally moved anything - by, say, squeezing the arms together. Sometimes, I'll find I have everything aligned properly, and I find I have a mysterious tight spot. The fins fit between the arms everywhere except where I want to put them, and I can't slide the fin in place. What has happened is that I have accidentally gotten some glue on the aluminum guide arms when I built the last rocket. If this happens, there's an easy way to fix this. I take some steel wool or some very fine sandpaper - nothing coarser than 400 grit - and gently rub off the glue. Aluminum is soft, so you don't want to use anything too harsh on the guide arms, or you'll take off material. But once you have any leftover glue removed, you should have no problem fitting the fins in place. It would be nice if the Big Dog had through-the-wall or TTW fin construction - where the fins have tabs that go through a slot in the airframe and attach directly to the motor mount tube. On higher power rockets, this makes the fin connection much stronger. The Big Dog can take large E, F and G motors. You could even put a small H motor in there - which would be a high power motor, and you'd need a certification to do that. But I imagine that would be a bad idea - the Big Dog fins simply get glued to the outside of the airframe, like many smaller, low power rockets. Because of this, I want to make sure the fins are on really securely. I don't want them to rip off during flight - an event called a shred or shredding. But I also want to make sure they're tight and sound when the rocket lands. These are some big fins! I'll start by using wood glue, as I usually do with all my smaller models. And the best practice is to use a double glue joint. Put the glue on the fin root, attach the fin to the rocket, then remove the fin again and allow the glue to dry. Double glue joint - the fin is in the foreground. Then, you'll run glue along the root of the fin again, and this time, when you attach the fin to the rocket, it will lock in place, creating a much stronger bond. I used to attach one fin, move to the next, then the next, and the next, attaching fins around the rocket. And sometimes I'd find they'd be out of line with one another. Your pencil line will be thinner than the fin itself, so it's easy to get things slightly misaligned when you do it that way. Now, I do one fin, then turn the rocket 180 degrees, and do the opposite fin. That way, I can check the alignment as I go, and if my fin lines are marked correctly, everything will be correctly aligned. Unfortunately, the shadows in this picture and the fact that my camera fisheyes a little bit close up distort the image and make this look a little crooked - but I double and triple checked the alignment of these fins. Once I got all the fins on and the glue had set overnight, it was time to do the fin fillets. I've noticed lately that on all of my previous rockets, you can't see the fillets. I know they're there, because I put them there. But I used wood glue, and I made them small. Wood glue shrinks as it dries, so unless you look very closely at the rocket, you wouldn't see them at all. They do add strength, but there's more to fillets than simply reinforcing the bond between the fins and the airframe. Fillets also make the rocket look better. Nice, smooth round fillets are a source of pride to a rocketeer. And a good, smooth transition from the fin to the airframe can reduce aerodynamic drag, by reducing turbulence at the joint. But fillets can go too far. As was recently pointed out to me by an aerospace engineer (online - we don't have a lot of aerospace engineers where I live), there's a tradeoff. Because in The Handbook of Model Rocketry it is asserted that good fillets = less drag, a lot of people go kind of overboard on the fillet radius, making fillets that are far larger than necessary. They look cool, but all that extra surface area creates more friction drag, which can negate the reduction of turbulent drag you're after. Basically, this guy says you should use a fillet with a radius no larger than necessary to strengthen the joint between the fin and the airframe. But for my purposes, and for a lot of rocketeers, I think a good idea is to choose a radius that looks right, and is proportional to the size of the rocket itself. 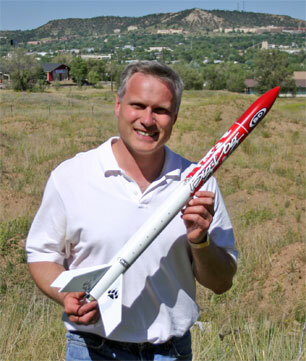 Unless you're into competition rocketry, and have access to a wind tunnel, a nice smooth fillet that's not too large or too small will improve the look and performance of the rocket enough to be satisfactory. A convention among some rocketeers is to go with a fillet radius that's as close as possible to 4% of the root chord of the fin - that's the length from the front to the back of the fin where it meets the rocket. I think it makes a little more sense to base the fillet radius that has to do with the diameter of the body tube. As it happens, I lucked out and got a good balance of both. You can create decent fillets with just your finger, and a lot of people do (though you definitely need to wear skin protection if you're working with epoxy). But to create an even, smooth fillet with a consistent radius, you might use a simple tool. I looked in my tool box and found some 5/16 inch dowel rods. Half of that thickness will be the fillet radius, and it looked pretty good for this rocket. Here you see a 5/16 inch dowel and a soft lead pencil. It was hard to do this and take a picture at the same time, but you get the idea. This will leave a line on the fin and the airframe, showing you where the edges of your tape should go. I taped off the fins and the airframe, plus the forward edge of the fins down to a point, and also masked the airframe in front of the fins. All this is to catch excess epoxy. Then I ran some tape around the motor retainer to protect it from drips. Epoxy is great for fin fillets for larger rockets. Longer cure-time epoxies are better, because they're stronger. They're also self-leveling, which means that the epoxy will smooth out as it sits, before it cures. This is a good thing, but it does mean that you can lose a little of the roundness of your fin fillets. Epoxy can also be hard to sand, which you might need to do if you want to touch up your fillets. Because of this, some people add fillers to epoxy. Fillers thicken the epoxy and give it different properties. In rocketry, one property people want is sandability. Microballoons are good fillers if you want to make your fillets weigh less and if you want to be able to sand them later. These spheres are microscopic, and are so tiny they look like a fine powder. A full bottle feels like it has nothing in it. They are so fine, you need to wear some protection when you work with them. I wore a dust mask, some gloves and some safety glasses. When I first took the cap off the bottle, some of the microballoons drifted upward, like smoke - that's how fine these things are. I used some more 30-minute Bob Smith Industries hobby shop epoxy. Fillers make epoxy start to stiffen up faster than they would otherwise, giving you less time to work. Because of that, you want to have everything in place before you start. Some things in rocketry are like cooking - you're much less likely to mess up and search for things in a panic if you apply the concept of mise en place - everything in place. Safety glasses, gloves, dust mask, tiny cup for mixing epoxy, tiny cup of rubbing alcohol, epoxy and filler, dowel rod, two craft sticks for mixing epoxy and applying it to the rocket. Also on hand but not in the picture: paper towels, folded and ready to go, and a squeeze bottle of rubbing alcohol. Also, because I had to work fast, there are no pictures of the fillet-making process. But here's how it goes down. Mix the epoxy according to directions. Then add in the microballoons and stir until you have a good consistency. With a craft stick, apply epoxy to the area between the fin and the airframe. Use the dowel rod to shape the fillet by running the end of it all along the joint between the fin and the airframe. On the first pass, you'll take off a lot of excess epoxy. You can clean up wet epoxy with rubbing alcohol, so you'll take a paper towel soaked in alcohol and wipe the excess off the dowel. Then you'll go back and do a second pass over the fillet with the dowel, and wipe off excess. Basically, you want to wipe off the excess until you stop seeing the epoxy which gathers on the tape trying to creep down into the joint. Then, you can make the fillet smoother by dipping the dowel rod in the little cup of alcohol, shaking off the excess, and running the dowel over the fillet a couple of times. Once you're satisfied with your fillet, carefully peel off all the tape, making sure not to get any excess epoxy on anything. Finally, check your rocket - if you got any drips of epoxy anywhere - on a fin, on the airframe, or especially on the motor retainer, grab a paper towel, soak it in alcohol, and wipe off the stray epoxy. Make sure to check the fins on the opposite side of the rocket to make sure epoxy didn't drip down and fall on them - once the epoxy hardens, you're going to have a heck of a time getting it off there with some rigorous sanding. When you're done, you'll have smooth, well-rounded fillets. I let the epoxy cure for a few hours before moving on to the next batch. You want to make sure that the fillets are cured and firm, and that the epoxy isn't sticky. Overnight is best, but a few hours should do just fine. Now, because this was my first time using microballoons, I wanted to make sure I was using the right amount, and I was curious how strong the fillets would be with fillers. I had a scrap of body tube to which I'd glued a couple scrap fins. I had papered these fins when I was experimenting with that process. These ones turned out pretty well, and I'd wanted to see what they'd look like when they were primed - to see what a finished product with papered fins might look like. So, I took some of each batch of epoxy from my fillets and slathered a rough fillet on the scrap fins. I did this with each batch. As you can see from the fillet on the left, the first batch was sandable, but not terribly easily. I'd have to sand more than I wanted to. More sanding means more chance to scuff up an airframe or fin. The fillets on the right were much closer to ideal - sandable, but strong. Once the fillets were cured, I tried to snap off the fins, to see how strong the epoxy and filler was. I twisted and bent, completely distorting the body tube, but the fins would not break off! This gave me confidence - the fins on the Big Dog weren't likely to snap off on landing, at least, not at the root. So, the first set of fillets wouldn't be that sandable, but because I'd taken extra care to shape them and smooth them with alcohol, it wouldn't be a huge deal. The main thing would be to lightly sand off the ridges between the fillet and the airframe and fin. You don't want to see a sharp edge - a nice, smooth transition is what you want. If you do it with care, there won't be much to sand. It was tricky to see how much filler to use. The Top Flite instructions advise 3:1 epoxy to filler. But that's hard to eyeball, especially if you're trying not to get your face too close. Even with eye protection, there's no guarantee a current of air wouldn't waft some microballoons up and around my safety glasses, and call me crazy, but I don't want microscopic bits of glass in my eye. Consistency and color are what I went by. For some fillers, you want to get the consistency of peanut butter. I felt that would have been a bit too far for this epoxy, as the thicker it got, the less time I had to work - down to minutes. So I got a consistency that was nicely thickened, such that when I lifted some epoxy out of the cup, I got a slow ooze in a single strand from the mixing stick. As for color, the first batch had the appearance of watery skim milk - a little too translucent. The mixture I finally settled on had more the appearance of 2% milk. Here are some pictures of the first and second batch of fillets for comparison. It's hard to photograph semi-translucent fillets and get a good idea of what they look like, so here's a preview of the nearly-finished rocket. You can see how nicely rounded the fillets are. We're nearing the home stretch of the Big Dog build. Next, we'll turn our attention to the nose cone. After that, all that's left is to prime, paint, add decals, and attach the rail buttons (which you can see above).